As a new federal employee, each pay period I earn something I never have before: paid leave. 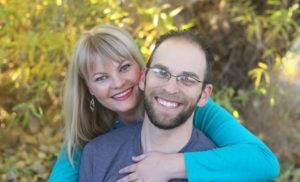 While I loved the autonomy of operating my own lawfirm, and I could take leave whenever I wanted, there was always a cost. If I weren’t doing the work, then I wasn’t getting paid. One of the other perks that we get in the Foreign Service is R&R. Each Embassy or Consulate has a hardship rating, based on a variety of factors. At the posts with higher hardship ratings, the State Department will pay for travel to designated R&R points, or to the US, so that we can relax and maintain some work/life balance. The allowance for R&R, however, is travel only. If I want to be able to enjoy that perk, I need leave. However, as a new federal employee, I haven’t earned much leave yet. The solution to this is comp-time. When I work overtime, with my boss’s approval, I have the option of receiving comp-time, which I can accumulate and use for an R&R trip. 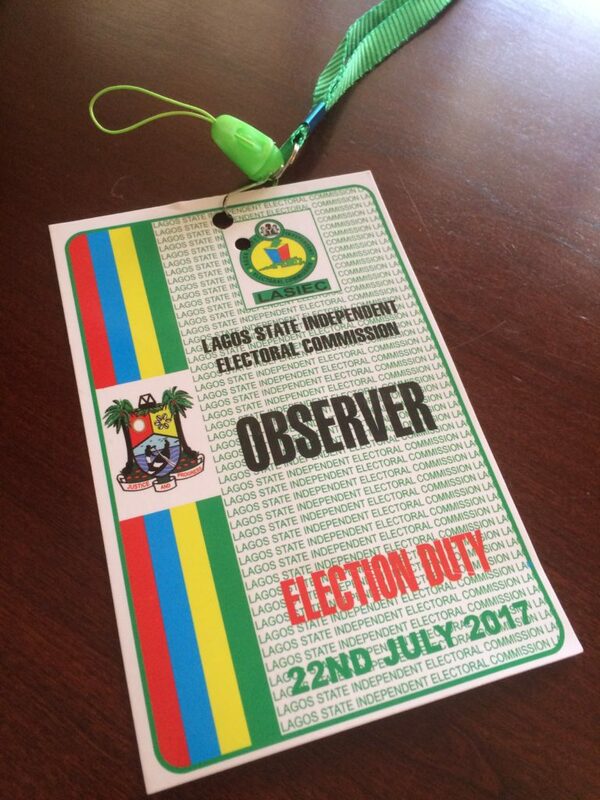 There have already been a few opportunities for me to earn comp-time, including last weekend, when I volunteered to serve as an elections monitor for the Lagos local government elections. That’s right, I can officially claim to be an international elections monitor. The elections monitoring group had a briefing at the end of the work day on Friday, which was really interesting. It went over the logistics of how we would go about the monitoring, the areas each group would work in, things to look for, contingency plans, and on and on. Nigeria became independent in 1960. Its transition to self governance was rocky, however, going through a series of military coups and dictatorships. However, since the start of the 21st century its democratic governance has greatly improved. 2015 was a big year for Nigeria, in fact, as it constituted the first peaceful transition of power from the ruling party (the PDP) to an opposition party (the APC), in an election that was widely considered to be reasonably transparent and fair. We will be here in February of 2019 for the next scheduled presidential election, which should be excitnig. 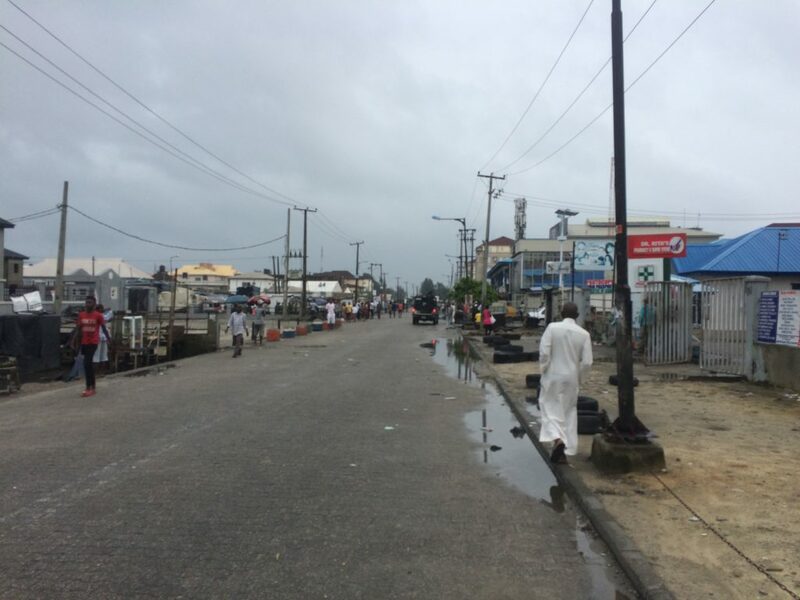 Last weekend’s local government elections were nowhere near as weighty as a presidential, or even a gubernatorial election, but they were still widely viewed as a referendum on the APC, and a borometer of how Nigerians feel about the way the APC is governing. The group was going to meet the next morning at another apartment building, a few blocks from where we live. Everyone else in the group lived either there or in another building just around the corner from it, so I was goign to walk there and meet up with them. I woke up to the heaviest rainstorm I have ever experienced. I put on my raincoat stuck my backpack into a garbage bag to keep it dry, and headed out. 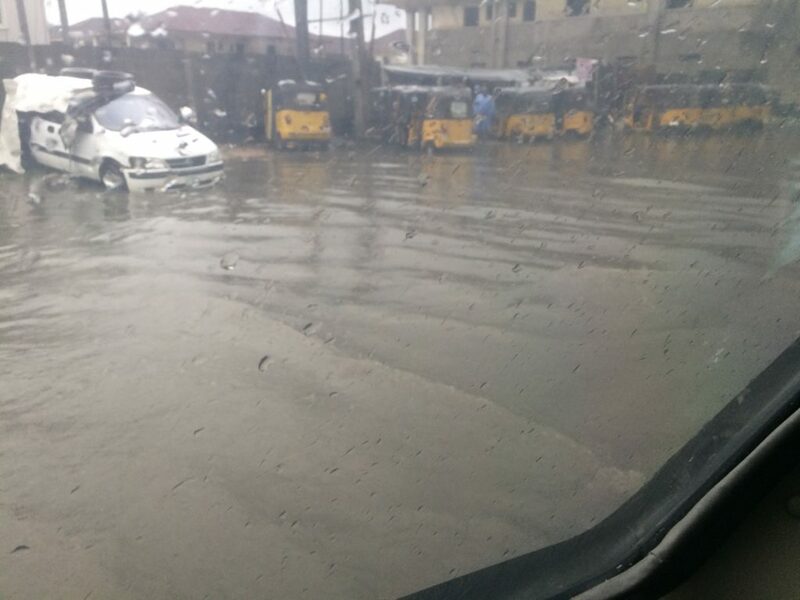 There are a lot of potholes here in Lagos, even in the affluent portion of the city where we live. Drivers will swerve all over the road to avoid them. When it rains, people will put old tires in them, or treebranches, to warn drivers. They can be hazardous, as some are VERY deep, and you can’t tell how big they are when they are flooded. I picked my way around them as the rain poured down in buckets. Even as I avoided the potholes, the water was flowing down the street so deep it was over the top of my tennis shoes in many places. By the time I had walked the 5 blocks or so, my backpack and the top of my body, protected by trash bag and raincoat, were only mildly damp. My pants and shoes, however, would not have been any wetter had I just jumped into the swimming pool with them on. Not the most auspicious start to the day. We were also wondering how the rain would impact the election. The polls here are all outdoor. They are set up every 2 blocks or so, sometimes tucked under the overhang of a building or a tent, but they are not well protected. Fortunately, the worst 10 minutes of the rain was the 10 minutes I was walking in it, so it delayed the election a little but it happened as planned. 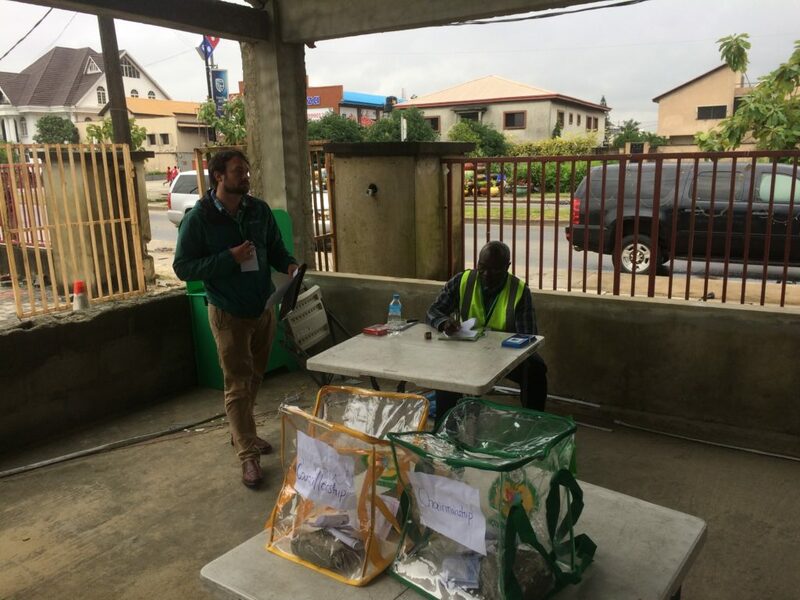 We started by going to some of the local government buildings (like city hall, but there are many of them here) to see the election materials going out to the polling units. It was absolutely inspiring to me to see the many many volunteers who were running the election. Democratic self governance is a great thing, and Nigerians believe in it fervently! It is interesting, while there is still a lot of “Chicago style politics,” that we were watching for, that does not in any way dim the election enthusiasm. From there we set off, stopping at dozens of polling units once the voting got started, and observed. We drove through some very wealthy areas, and also through some very dense-packed shanties. In some areas the rain had a relatively minimal impact. In others, the impact was considerably more significant. Yes, that is a bow wave created by our car as we drove through this water. 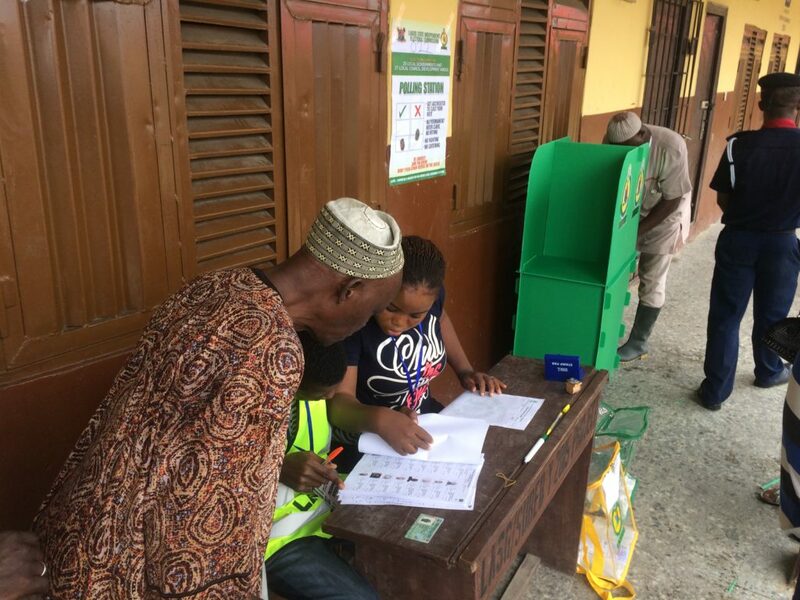 At each polling unit, we noted the number of voters registered, the number who had voted so far, whether or not there were party agents present, and if there was anything unusual going on. The party agents were credentialed and were ostensibly doing a similar job to ours, keeping an eye on things and making sure nothing untoward was going on. They were supposed to be keeping back from the voting booth and the ballot box, but due to the rain many of them were crowded in under the awnings. My colleague talks to a polls worker. 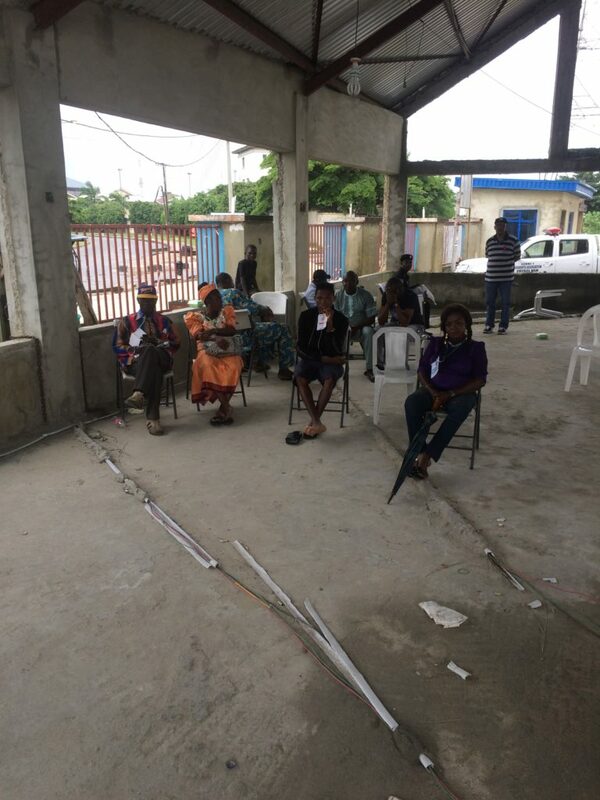 Party agents from 4 parties observing – far enough back at this polling unit, due to the large roof. The voting process was interesting. Each voter presented a voter ID card to the polls worker. After the polls worker verified that the voter was registered and on the list for that polling unit, a mark would be made on the voter’s left thumbnail with indelible ink, and the voter’s right thumb would be inked and a ballot distributed. The voter would then step over to the voting booth and place a thumbprint with the ink next to the party of his or her choice. There were no individual candidates on the ballot, just parties. Finally, the voter folds the ballot and places it in the transparent ballot box. A voter is accredited while another voter casts his vote. We had the benefit of some of our Nigerian local staff performing the observations with us. They were very experienced and knowledgeable about Nigerian elections. They helped us understand what was going on, and could give context to what we were seeing. We did see 1 man who was being turned away because his voter ID card indicated that he was female. He was swearing up and down that he had voted every year with that card, but the polls worker wasn’t having it. Our experts speculated that the card was probably not fraudulent, but just a typo. In the poorer areas of town, there were long lines of voters waiting to vote and many votes had been cast when we did our observations. In the more affluent areas, we saw empty ballot box after empty ballot box. We were assured by our experts that when the votes were officially reported, even these areas would magically have very high turnout rates. We didn’t see any overt influence by the party agents, but of course, we could only spend a few minutes at each polling unit, and who knows what happened after we left. 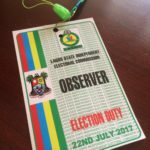 At most polling units there would be a party agent for each party on the ballot at that unit. At some units, however, there would be additional party agents for parties not on the ballot. They were noncommittal when I asked them why they were there, and when I asked the polls worker about it he just shrugged and said, “This is Africa.” This was a very cool experience, and I am glad to have been able to participate in it, and of course, I’ll be doubly glad when I can take a day of vacation as a result of my work! 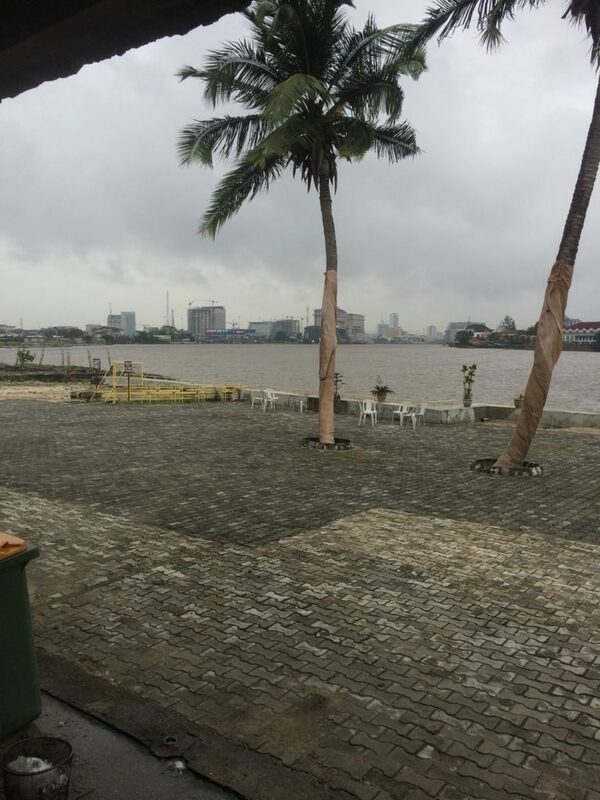 A pretty view of Lagos, from one of the polling units.